Every good golfer will tell you that once you have selected your shot, you have to commit to it for it to come off successfully. You can’t still be deciding or wondering if you’re doing the right thing. People who say that are exactly right, but when we try to put that thought into practice it isn’t that easy. Why not? Perhaps it’s because we don’t understand what commitment really is. When we go through a conscious process of judging the course and matching what we see with the shots we know we can hit, or want to hit, the result is never something that we can truly believe in. There is always lingering doubt as to whether we can pull the shot off, or whether we have evaluated the situation correctly in the first place. Sometimes that bit of doubt is too small to see, other times it it is so large we can hardly move the club. There is no way that we can commit to a shot if there is a possibility, no matter how slight, that it is the wrong shot or that we aren’t good enough to hit it. We have to make a change somewhere. Commitment is not an agreement you make, or a promise or a pledge to do the right thing. Nor does it imply an obligation to do something in a moral or a legal sense, as the word is commonly used. The commitment I am talking about is a feeling which exists in your mind and infuses itself into your body that what you are about to do is correct. You have a deep subconscious knowing that transcends success and failure. The knowing in your mind and the knowing in your body are the same. The only thing left is to perform. See shot, hit shot. I know you have had that feeling on the course before, and if you would just take a few moments to reflect, you would be able to remember an occasion or two when you felt that way about a shot. I would be willing to say that the shot came off quite nicely, too. The question is, then, how do you get to that state at will? How do you make it more than something you enjoy once or twice a year? That’s about as clear as words can describe it, and if you have to be specific yourself about what that meant, you probably couldn’t, but that’s all right. You don’t have to be able to express something in words to know it. In fact, that knowing is probably superior in most cases to what you can articulate. A year ago I was about 80 yards from the green on a par 5, on the right side of the fairway just about ten feet above the green. The pin was on the back tier. Pitching the ball to that tier would have been risky, because over the green is a severe downhill slope. A pitch to the front of the green would not allow the ball to run to the hole because of the elevation difference. So I just kept looking. The ground to the left of the green sloped away, too, so I looked right. I kept looking right and because I didn’t see a shot, I kept looking more right. More right and more right, and suddenly it all made sense. I could punch an 8-iron over to the mounds on the right and let the ball roll down them onto the back tier so the ball would approach the pin from dead right. I know how hard to hit the ball and just where to aim the shot. 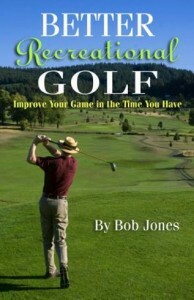 In less time than it takes to say so, I pulled out the 8-iron, lined myself up to what I “saw,” and hit the ball. It rolled exactly as I knew it would, off the mounds to ten feet from the hole. I would like to end the story be saying that I sank the putt, but I didn’t. Seeing clearly doesn’t guarantee perfection. 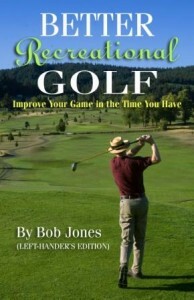 But the 8-iron I hit I was committed to as I described above. 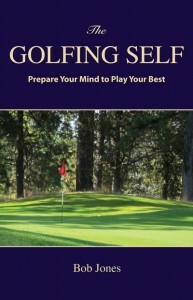 It’s a good way to play golf by using a mental skill I practice with every ball I hit in play and on the range. It’s as much a part of your setup as anything else you do to get ready.